It’s a new day, and as a relationship expert if I’m going to get the most out of it then I have to start it off right. For me to rise and grind I make sure I do three things in the morning (other than wash up and get myself together). I eat a good breakfast, because it is so essential to feed the body what it needs to operate at a high level. I do some praying and reading, because for me personally it is important to also feed my spirit and my mind to get me moving in the right direction. To finish it off I do some exercise to get the blood flowing and my energy level raised. I’m not always perfect with my routine, but I strive to get it in so that I can be as productive as possible for the day. Remember that everyday is an opportunity to embrace the possibilities that come with waking up and heading back into the world. 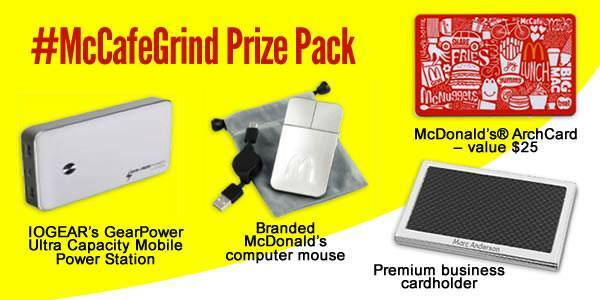 Check out my quick video below and then scroll down further for your chance to WIN a FREE #McCafeGrind Prize Pack. Share this offer and great opportunity with your friends and family so they can take advantage too! ’I’m going to get a free cup of @McCafe Coffee from 3/31 to 4/13/14 at participating McDonald’s #McCafeGrind – Get Yours Too! Rise and Grind’ [click to tweet]. Disclosure – This post is brought to you by McDonald’s®. I have partnered with them to spread the word about Free McCafé® Coffee Week’ happening March 31 through April 13 at all participating McDonald’s® restaurants in the U.S. Stay up to date on Free McCafé® Coffee Week via @McDonalds and @McCafe on Twitter. All opinions and stories are my own.